This is great news as FIT is much more accurate and easier to complete than the current screening test, which means we could potentially save more lives from bowel cancer – the UK’s second biggest cancer killer. Over the years we have proactively engaged with the Bowel Cancer Screening Programme to campaign for this change. Last year we worked with the Cancer Taskforce to ensure adoption of FIT was included as a recommendation in the Cancer Strategy, and we made a strong case for change in our response to the UKNSC consultation on whether the Programme should adopt FIT. Earlier this year our campaign supporters tweeted and wrote to Jane Ellison MP, Minister for Public Health, to encourage her to approve the recommendation and lots of you took part. Thank you! So what is FIT and why is it better and more accurate than the current test? FIT works in a similar way to the current screening test by detecting tiny amounts of blood in the stool that could indicate cancer or large polyps, growths that can develop into cancer. However FIT measures blood in a different way from that used by the current test, the guaiac faecal occult blood test (gFOBT). FIT measures the level of blood in the stool whereas gFOBt only indicates the presence of blood. Because of this, it is more accurate than the current test. The FIT kit consists of a small plastic bottle containing a stick with a grooved tip. The FIT sample is collected by scraping the tip of the stick along the bowel motion so that the grooves are covered. The stick is then returned to the bottle which contains a liquid to preserve the sample. The bottle is clicked shut and can then be safely posted back to the screening laboratory for analysis. The key difference here is that FIT requires only one sample rather than three like gFOBt. In April 2014, the Bowel Cancer Screening Programme began a six-month pilot study to assess the clinical, financial and organisational implications of adopting FIT in England. The pilot took place at two of the five regional BCSP Hubs (Southern Hub and Midlands & North West Hub) and their associated Screening Centres. The pilot found that FIT has many practical and clinical advantages over the current gFOBT including picking up more cancers and improving uptake. Picking up more cancers: The pilot found that FIT picks up twice as many cancers and four times as many advanced adenomas as the current screening test. This is important because the more cancers we can pick up early, the more lives we can save. We know that cancers picked up through the screening are more likely to be early stage cancers. The earlier bowel cancer is detected, the easier it is to treat and the greater chance of survival. Improving uptake: FIT has been shown to increase the number of people participating in the Bowel Cancer Screening Programme, particularly for previous non-responders and first-timers, as well as hard to reach groups, such as ethnic and deprived groups. It increases uptake by 10% and doubles it in people who previously haven’t responded. Currently only around half of those invited take part in the Bowel Cancer Screening Programme, meaning opportunities to detect cancer early are being lost. Ministerial approval means that the Bowel Cancer Screening Programme can begin the process of implementing FIT. This could take up to 18 months and we’ll be working with them to ensure FIT is implemented on time. But we won’t be stopping there. While Scotland announced last year that they will be adopting FIT, both Wales and Northern Ireland have yet to agree to this happening. We’ll continue our campaign to make sure FIT is adopted across the UK. 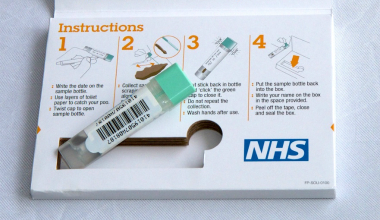 Meanwhile, until FIT is introduced we would encourage everyone, of screening age, to take part in the Bowel Cancer Screening Programme no matter where you live in the UK – it could save your life. Find out more about screening here.